The first day of the 2018 draft is in the books. 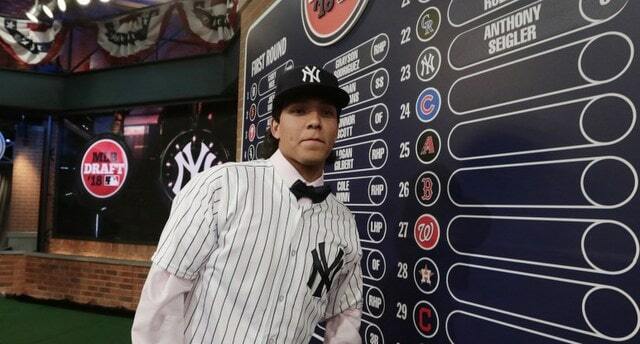 A total of 78 picks were made Monday night, during Day One of the draft, and among them were the Yankees’ first (23rd overall) and second (61st overall) round picks. Teams do not draft for need, especially not in the first round, but the Yankees have a hole at catcher in the farm system and they doubled up on backstops with their first two 2018 picks. Let’s review the two Day One selections. Few teams in baseball have had as much success developing catchers in recent years as the Yankees. Gary Sanchez is already a top tier catcher, Francisco Cervelli has been a solid starter since being traded away, John Ryan Murphy is emerging as a starter with the Diamondbacks this year, and Austin Romine is either suddenly awesome or a perfectly acceptable backup. Don’t forget Luis Torrens spending last season in the big leagues as a Rule 5 Draft backup too. That’s a lot catching talent to come out of the system these last few seasons. So, with first round pick Georgia HS C Anthony Seigler, the Yankees stuck to their strengths and added another catcher. They know how to develop ’em, so why not? Seigler sure does check a lot of boxes. He’s a switch-hitter — and a switch-thrower when he pitched in high school, so that’s cool — who has good contact ability and a sound approach, plus he’ll hit the ball out of the park occasionally. And when he does, he can show off his elite bat flip tool. Furthermore, the 18-year-old Seigler is a good receiver and a good athlete behind the plate, good enough that he’s played second and third bases on occasion. He’s a very good thrower — Seigler throws righty when behind the plate, because duh — who has all the tools necessary to be a strong defender. On top of that, Seigler was lauded as having some of the best makeup and work ethic in the draft class. He’s a very hard worker and a total grinder on the field. If he were a a non-catcher position player, his uniform would never be clean. The Yankees know catching. They didn’t draft Seigler because the system is light on catching prospects — it’s too difficult to project needs three or four years into the future, when most of these kids will be MLB ready, so you’re doing yourself a disservice if you draft for need in the first round — they drafted him because quality catchers are hard to find and because they believe he had the best long-term potential of anyone still on the board. Switch-hitting catchers are my jam. I really like the pick. By and large, the MLB Network draft broadcast is tedious and tough to watch. I get why MLB is trying to make the draft a thing, but the MLB draft is not a thing and will probably never will be a thing. None of these kids is going to step right onto their big league team’s roster and college baseball is not nearly as popular as college football or college basketball. Casual fans see these kids they’ve never heard of at the draft and they might not see them again for four years. Good for MLB for trying. But the MLB draft is never going to be popular among non-diehards.
? Baseball America (subs. req’d) ranked Breaux as the top junior college player in the draft class coming into the spring and, in their latest rankings, they had him as the 83rd best prospect in the draft overall. MLB.com had him 71st. More or less where the Yankees grabbed him given how little usually separates draft prospects beyond the first 15-20 picks or so. Seigler and Breaux are very different players. Seigler is a switch-hitter with a well-rounded game. Breaux was a two-way player in college — he’s run his fastball as high as 100 mph off the mound — who, as a catcher, is reminiscent of former Yankees farmhand Peter O’Brien. He has big right-handed power and questionable plate discipline, and he has work to do to remain behind the plate. There are a few key differences between Breaux and O’Brien, however. First of all, Breaux is already a better defender than O’Brien was at the same point in his career, and he’s made significant strides behind the plate this spring. Secondly, the Yankees drafted Breaux as a sophomore whereas O’Brien was a senior. The Yankees drafted O’Brien a few weeks before his 22nd birthday. Breaux is only 20. Age is on his side. And third, Breaux has had success with wood bats. 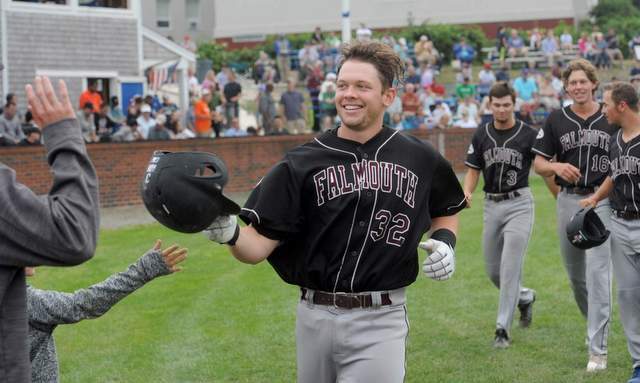 He hit .271/.310/.474 with six homers in 35 games against top college competition in the Cape Cod League last summer. O’Brien hit for zero power (.325 SLG) with more strikeouts than you’d like (26.2%) during his summer in the Cape Cod League. The overall skill set — power over hit, sketchy defense — is similar. Breaux is younger than O’Brien was at the time of the draft, however, plus he’s already better with the glove and has fared better with wood bats. That’s not nothing. Breaux has more flaws than Seigler, both offensively and defensively, though that comes with the territory when you’re comparing a second rounder to a first rounder. What Breaux has going for him is legitimate above-average power, a rocket arm, and an organization that really knows how to develop catchers. Was he my preferred choice for the second round pick? Nah, but what the hell do I know. Can’t ever go wrong with a catcher with offensive potential though. Either intentionally or coincidentally, the Yankees grabbed catchers in the first two rounds of the 2018 draft at a time when they’re very short on catchers in the farm system. I don’t think it was intentional. I really don’t. They like well-rounded up-the-middle athletes and that led them to Seigler. They also like dudes with standout tools, and Breaux has two of them in his power and arm. It just so happens both guys filled a glaring organizational need.